Creative Commons Attribution 3.0 Licence. John Gore’s seminal 1984 paper on gel dosimetry spawned a vibrant research field ranging from fundamental science through to clinical applications. 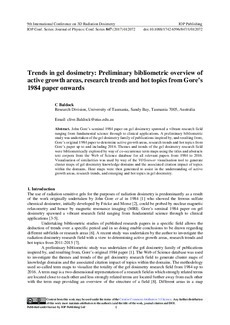 A preliminary bibliometric study was undertaken of the gel dosimetry family of publications inspired by, and resulting from, Gore’s original 1984 paper to determine active growth areas, research trends and hot topics from Gore’s paper up to and including 2016. Themes and trends of the gel dosimetry research field were bibliometrically explored by way of co-occurrence term maps using the titles and abstracts text corpora from the Web of Science database for all relevant papers from 1984 to 2016. Visualisation of similarities was used by way of the VOSviewer visualisation tool to generate cluster maps of gel dosimetry knowledge domains and the associated citation impact of topics within the domains. Heat maps were then generated to assist in the understanding of active growth areas, research trends, and emerging and hot topics in gel dosimetry.